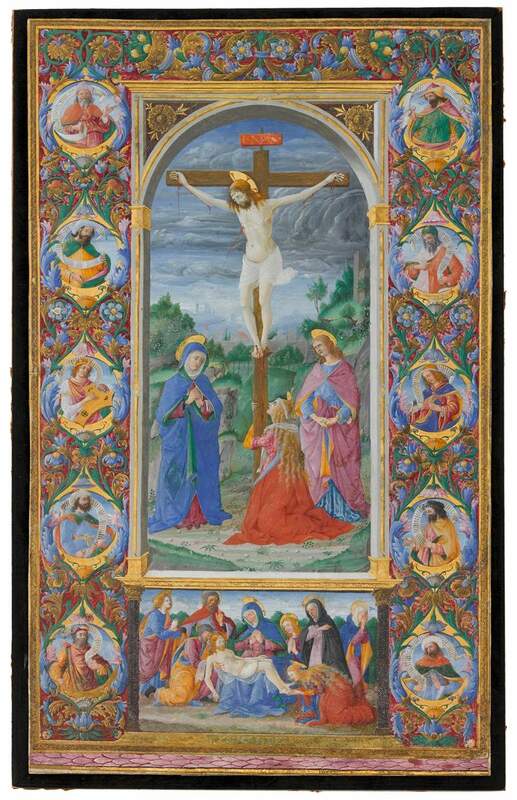 Once in the Missal of Pope Innocent VIII, which was kept in the Sistine Chapel, this leaf showing the Crucifixion would undoubtedly have prefaced the Canon of the Mass and represents, therefore, the most prestigious miniature of this papal service book. The illumination of this book has been attributed to the anonymous Master of Innocent VIII, who in 1995 was identified as the notable artist Giuliano Amadei (documented in Florence 1446 - d. in Lucca 1496, Rome, 1484-1492). He was a well-known and highly active manuscript illuminator and panel painter, famous for his precise and delicate painting style and his use of rich border decoration often involving cornucopias. The Crucifixion reveals an almost serene atmosphere in the gestures of the characters and in its warm, deep colours. This miniature show the artist’s careful efforts to distinguish Christ's dead body from those of the living, painting his skin in a paler whiteish colour than is used for other figures. The monumental quality and the spiritual calm of the composition prefigures the artistic achievements of the Italian High Renaissance. This work is now in the collection of the J. Paul Getty Museum in Los Angeles.